There is something about spending the summer at a sleepaway camp that allows kids and teens to connect in a way they just can’t at school. Maybe it’s the extended time they spend together or the fact that selfies and Instagram and the social media comparison epidemic is taken out of the equation at camp. Whatever the reason, campers are able to interact and build relationships on a deeper level at camp than they can at school or on sports teams at home. One of the major reasons campers can form such strong bonds in such a short amount of time at camp is because they’re unplugged. They are not distracted by putting filters on their Instagram pictures or obsessively tracking how many likes their status update receives. Instead, they’re having real conversations and real experiences that trump scrolling through social media any day. Since their faces aren’t glued to a screen, campers can actually look at each other and talk to each other, and it re-enforces the power of human connection. Another reason campers connect on a deeper level with other campers is because of the extended time they spend together. While kids spend a majority of their day at school, most of it is spent in the classroom, with pockets of time throughout the day where they can freely interact with their peers and work on building relationships. At summer camp, communicating and building relationships is all campers do. From the moment they wake up until “lights out” campers have two jobs: have fun and make new friends. This is why camp relationships are so strong from the get-go because campers have nothing but time to work on establishing trust and friendships with their peers. 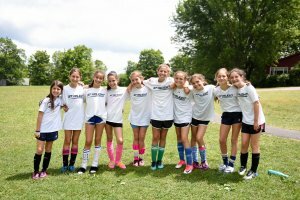 Many campers who attend Camp Starlight are active in sports teams and clubs at home. But at home, when the game or practice is over, the team goes their separate ways. At camp, you walk off the field with your team AND your opponent and make s’mores around a campfire together. This time spent together strengthens relationships of teammates and helps establish healthy attitudes towards competition and sportsmanship. Camp builds community because camp is a community. At school, students are usually focused on trying to find the little group that they can fit into. At camp, everyone is in the same group. Of course, individuals find their own smaller circle of friends, but at the end of the day, around the campfire, everyone is a camper. Everyone is there for the summer of their lives. Lifelong friendships are started at Camp Starlight because of the traditions, memories, and experiences they share. It is common for campers to comment on the differences between their school friends and their camp friends. There always seems to be something a little more intimate, a little more solid in their circle of camp friends. Probably because these friendships are based on shared experiences, honest communication and quality time instead of Instagram followers and Facebook likes. This entry was posted on Tuesday, November 6th, 2018 at 2:48 pm	and is filed under Summer 2018. You can follow any responses to this entry through the RSS 2.0 feed. You can leave a response, or trackback from your own site.